When Adam's Pool was first stocked with catfish some 25 years ago there was a trial tagging program involving the use of pheasant tags inserted into the tails of the catfish, this was done to see if we would be able to monitor the growth rates of the catfish but unfortunately it was found that the pheasant tags fairly quickly fell out or were pulled out as the cats went about their business so sadly that trial ended. 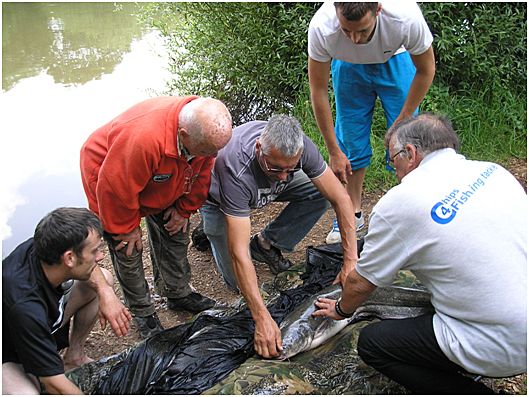 Fast forward to 2013 and the topic cropped up again about tagging the catfish and with CCG member Craig Woodland having already tried it out on his own stock of cats, the committee started to look into the benefits of chipping the group's catfish in Adam's Pool. Over the years, there have been many rumours of fish growing legs and moving from Adam's Pool to other waters, I suspect all waters suffer from these rumours and they may or may not be true. 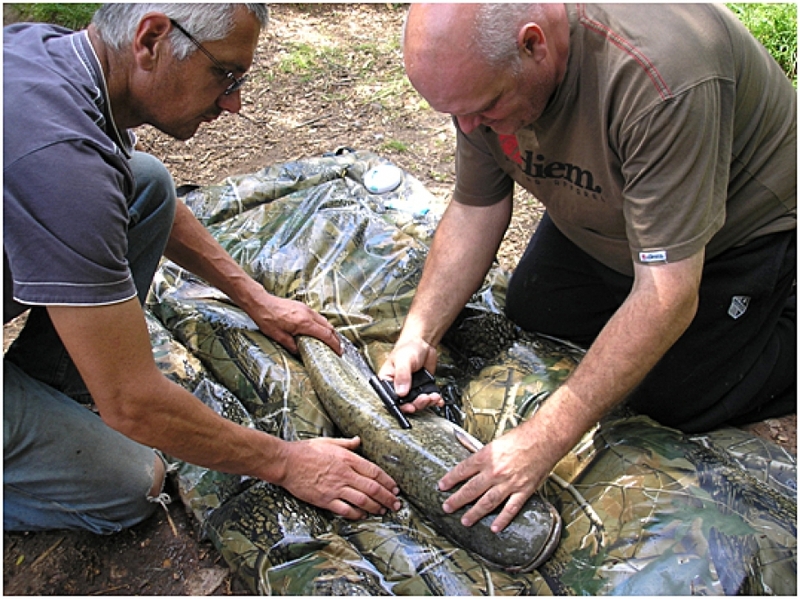 If a catfish had been moved to another lake and you suspected it, what could you do about it? Not very much if the truth be told as it would be nigh on impossible to prove that a catfish caught from another water came from our own water as catfish change colour and weight and don’t really have individual distinctive markings apart from a missing whisker maybe, so by the insertion of a microchip you would have definitive proof that a cat belonged to The Group. We have a specialist scanner available that can be placed in a lake and will read microchips as fish swim by thus proving that our catfish are present. Even if a cat showed up in another water, the police could take positive action as the microchip can’t be meddled with! Is it a bit big brother ? Some would say yes, but the group hasn’t got an infinite amount of money and we have to look after our assets and our assets are the stock of cats in Adam's. What about the scenario of some unlawful netters coming one night or over the winter and netting Adam's illegally? What would the group do? Well with the signs put up around the pool warning of the cats being micro chipped one would hope it would put off all but the most determined of fish thieves. So what do the syndicate members get out of it? Well a scanner is going to be left at the pool for members to use so apart from just catching cats you can get involved in the recording of data and see if any patterns develop with certain fish which should give another interesting aspect to the fishing at Adam's, some members have already expressed a keen interest in the program by offering to buy their own chip scanners and think it may help them in the long term catch more catfish. 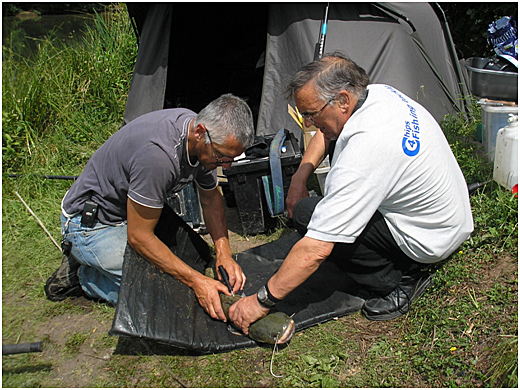 One CCG member who has never fished at Adam's now wants to join the syndicate purely to be involved in the chipping program! The micro chips are very small and are the same as the chips that a vet implants into your cat or dog; they are contained within a needle and have a 15 digit code that is be read by pet scanners. 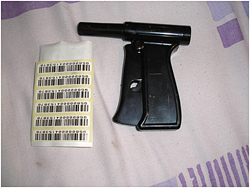 Microchipps are inserted with the use of a needle gun. Who can insert the microchips? 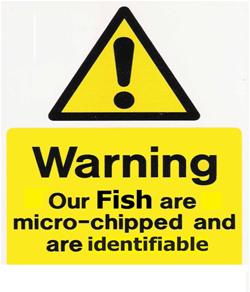 Only trained personnel can implant the chips or even order further microchips, on the weekend of the 21st June 2014 Tony Loveless from Chips4Fish came down to Adams Pool to carry out the training and product familiarisation course. The people who carried out the training course were Ray Allsop - Adams Pool Controller Karl Lawes – Adams Pool Bailiff Barry Bloomfield – Newsletter Officer and CCG Committee Member Only the above named persons will do any chip implanting and there will be no tagging equipment or needles left at the pool, only the scanner for reading purposes will be left for members to use. Please note that a sharps box is used to store all used chipping needles, this is for everyone’s safety. What is the chipping procedure? 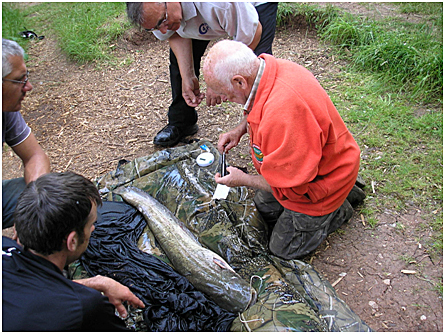 The chipping process is relatively easy, a needle is inserted in to the needle gun, this contains the chip, then the needle is inserted into the cat below the dorsal fin but above the lateral line. We have decided that the cat will be laid on its right hand side with the head looking to the left, this is so the chips are all roughly in the same place on each cat so scanning of the chips will be easier. Once the needle is in, you pull the lever on the needle gun to release the chip, withdraw the needle leaving the chip in the fish and cover the area with Bonjela or fish antiseptic, obviously it’s wise to check the chip is working with the scanner before you insert it into the fish and then check again once it’s been inserted before releasing the catfish. Only the qualified personnel will do any implant chipping so if you catch a cat and one of us is on the lake come and get hold of us so we can microchip it. 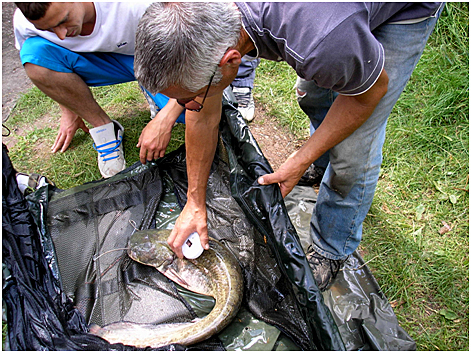 We don’t want fish retained for long periods of time though, if we are not at the pool or cannot be contacted the cat has to go back, fish welfare has to come first. To turn the scanner on just press the green button on the left hand side, do not hold the green button down as it will go into a set up mode, one short press is sufficient, the scanner screen will say “English” first then “press scan” when “press scan” shows on the screen, press the green button again and “reading” shows on the screen and its ready to scan! How to use the scanner on a catfish As I have mentioned above lay the cat on its right hand side with the head looking to the left, hold the scanner 5 – 10 cm’s away from the catfish just below the dorsal fin, if there is no chip present then it will say “no tag found” and the scanner will bleep three times. 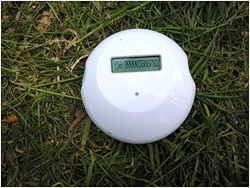 If there is a chip present the scanner will display a 15 digit number, record the last four numbers in the catch book along with date, weight and bait, it’s as easy as that. Please keep the scanner clean and out of the water. 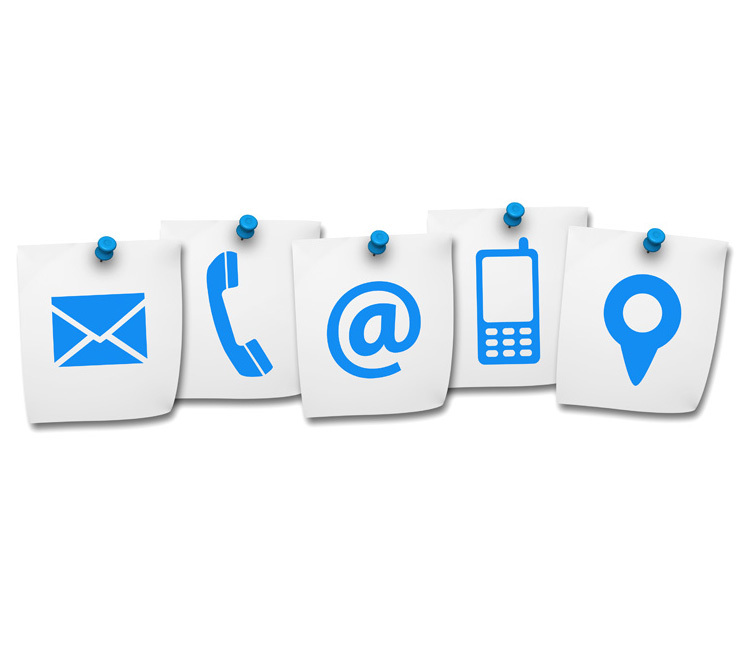 The scanner will be kept at the pool with and will be accessible to Syndicate members only. At the moment we are recording the chip numbers in our own books as we chip the cats and all the details will be collated and stored on a spreadsheet which will be available to members on a regular basis. A laminated copy will also be left at the pool for easy reference by the syndicate members.